Whereas Web View let you send an OpenGL representation of your drawing to clients and coworkers, it is now possible to render out a complete 360 degree view from within Vectorworks, using Renderworks modes. To create a rendered panorama, first set up your view the way you want the panorama to appear. This can be from a saved view with class and layer visibilities included, or you can set these up manually right before export. The rendering mode you are currently in and the resolution of your drawing area won't affect the export, these are controlled in the export settings. Under File > Export, select Export Panorama. You will be able to export the file locally or to cloud storage, and if you choose to store it on the cloud, you can get a direct link that will let viewers view your panoramic render natively in a browser. If you choose to open the resulting panorama JPG directly from local storage, you will see the distorted perspective image, similar to those used in Renderworks Backgrounds. 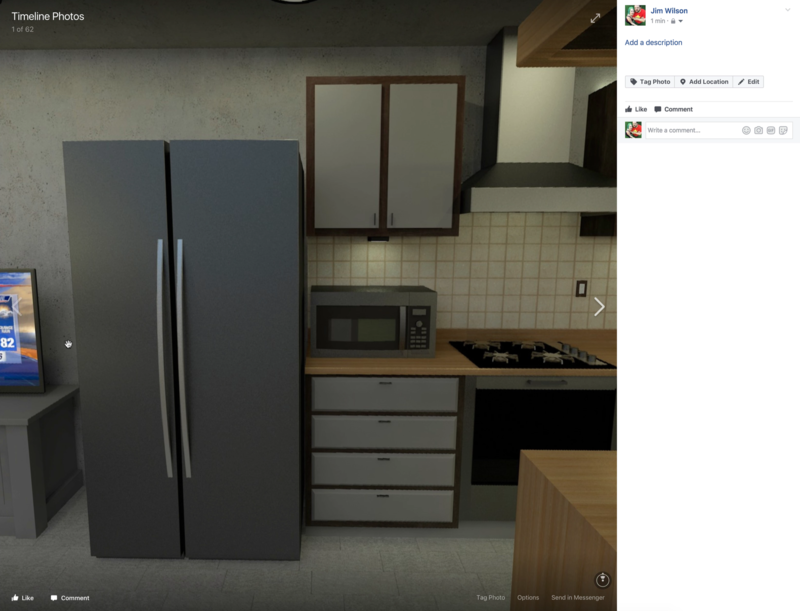 To view it as a 360 panorama, you will need to open it in a compatible viewing application on your desktop or mobile device, or upload it to a service that provides one on the web, like Facebook. Anyone who has created a Vectorworks Cloud Services account will be able to store their 360 pano on the cloud and share their links with anyone, but you will only be able to process files on the cloud if you are currently subscribed to Service Select. 1) Vertical seams to the back and right of the original view position - Fixed. This is great! 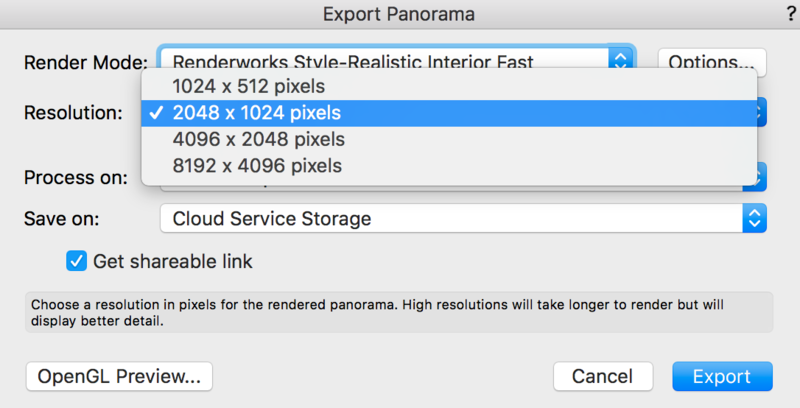 We used to have the ability to export panoramas up through 2016, with the "Export Quicktime VR Panorama" command, but that was locked into a Quicktime format whereas this new functionality seems to allow greater functionality in the end. I like that you can just get the jpeg if you want, which was previously difficult, if not impossible, to extract. Out of curiosity, was this new function built on the previous command's technology or was this something implemented from scratch? Also, are you able to control the initial view of the panorama? Nice. Probably more useful than web view. Completely new tech for us. The previous one was based on some things the QuickTime app could do, the new one is based on components of the Cinerender engine. Yes, the location you are in and the direction you are looking when you initiate the export is the starting view you will be exporting. I have been asking for this for decades. Now I can send my clients a google daydream or cardboard - and just send them updated renders. In addition to Cardboard (Haven't gotten the chance to touch Daydream yet) It even works really well on Gear VR, which I've been experimenting with. Samsung Internet is kind of the forced browser in that environment and we got it playing well with head tracking. If I can find a decent way to get a recording of that I will add it here. That is the beauty of being able to export the 'raw' image - is that it is SO versatile. This is a really great addition. THERE we go, got a recording working. Apparently the built in recording utility doesnt record fullscreen web pages (how our Pano viewer works on Cloud Services) for copyright reasons, but records local images just fine. The examples look great! It's exciting to see lighting in these. What are the lighting limitations if any? Is the an easy way to limit the panorama to less than 360 degrees - eg. For the view from a seat in a theatre where you haven't modelled the whole theatre behind the viewpoint? 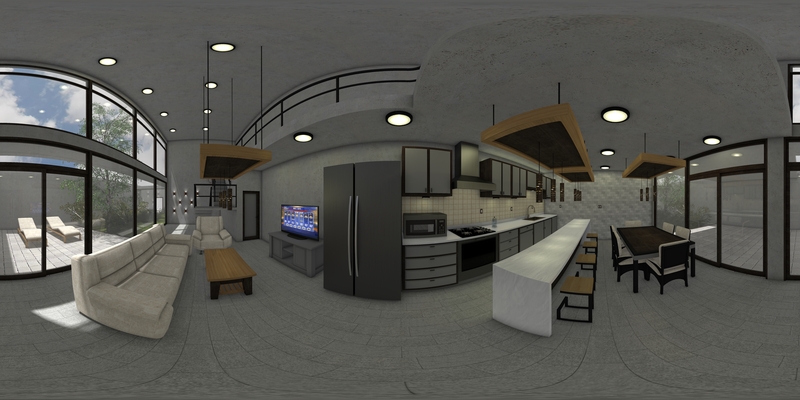 Unlike WebView, anything you see/render in Vectorworks will be seen/rendered in exported 360 Panoramas. You can not limit the pano angle for now (and most 360 image viewers assume the image is a full 360 currently so this avoids compatibility problems too) so I've been polishing up my complete models a bit more. What's a compatible (Mac) viewing application? 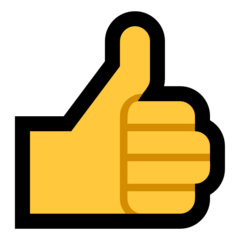 All the browser plugins that let you view 360 work just fine, and even the native Cloud link works fine with no plugins on all browsers I've tested so far. The cloud link will PROBABLY be the most common method for sharing since it doesn't require the recipient to install anything. I'll wish list this. I'd love to be able to set a field of view in degrees and have VW fill the rest with black or a colour. I'm sure once we have a chance to play with it there will be a way to solve it in the interim. For now the easiest way, (which i experimented a bit with but didnt go too far on) is to simply place a shell of solid black behind the camera, much larger than the whole scene. This stops the viewer from eyeballing that side without being to distracting from how it feels to be looking at a synthetic environment in real time especially when head tracking is in play. I tried just blacking out segments of the whole exported image in photoshop to emulate what VW could do if it just didn't perform those renders (a pano export is essentially 6 distorted perspective renders stitched together) but the effect was kinda strange. I have it marked for later tests to see if I can create a workflow for rapidly updating older models to accommodate this feature. I tried just blacking out segments of the whole exported image in photoshop to emulate what VW could do if it just didn't perform those renders (a pano export is essentially 6 distorted perspective renders stitched together) but the effect was kinda strange. I agree. With web view there's a certain level of skill in navigating, whereas a simple single-point panorama is much easier for any given end user to interact with. Plus I don't like giving too much control to the viewer to explore around. A lot of theatrical and television design is based on one or more specific points of view. Having control over these POVs is preferable over letting a viewer free-roam. I'm sure this varies by industry though. Plus the ability to RENDER the view and incorporate proper textures and lighting as you've designed them in VW is paramount (unlike WebView which doesn't look great IMO). I'm assuming it should be fairly simple to export a jpeg panorama, then in Photoshop do some simple touch-ups such as adding lighting glows/halos? (I realize the overall image will look distorted, but basic touch-ups and enhancements shouldn't be too difficult). Then resave and bring into the viewer of your choice. Is there any control over resolution / compression when exporting panoramas? Or are they always consistent? So far as long as I maintain the JPEG format, edits in PS work just fine. The only danger comes if you try to change to another format like TIFF, you can lose the 360 pano tagging embedded in the image that makes 360 photo viewer applications and social networks properly identify them as such. This is perfect. I like that we have some control, but it's not so open-ended that I have to think too hard about proper settings or resolution. Exactly. Aspect ratio is extremely important in panoramic images, getting it wrong by even 5-10% means the entire experience falls apart, so we removed it as a concern.